When the countdown to sunny spring begins, we find ourselves stuck in the transitional period - as in, the time between saying goodbye to Winter and saying hello to Spring. So, in celebration of such in-between days, we’ve put together a few styling ideas (based on street style favorites), to help you embrace any emending provisional weather with ease. Some might believe the wide leg trouser (which made huge strides down the runways for the season) is a bit out of reach unless you strut with supermodel height status. Not true! This look is so super accessible, easy to wear and particularly elegant. 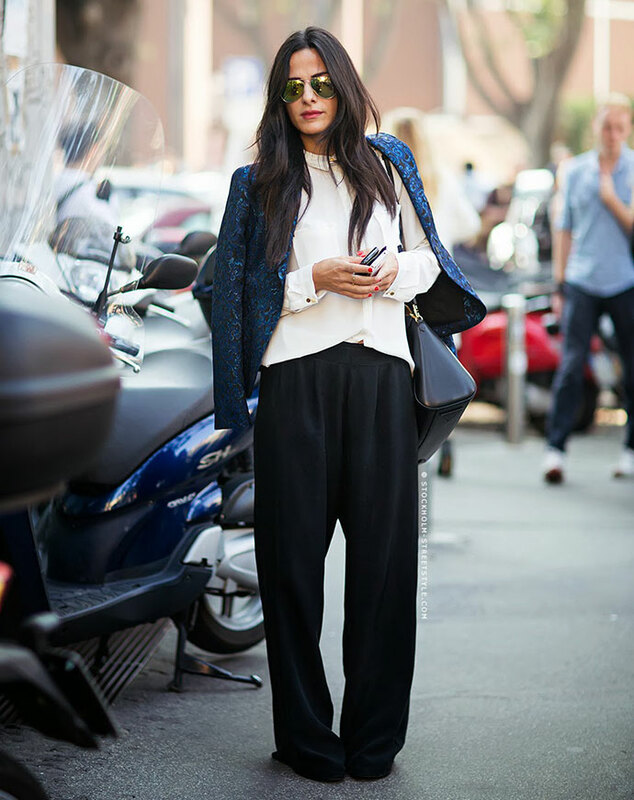 Try pairing the billow pants with a high-wasted cut or top them off with a sleek button-up. Also, throwing a jacket over your shoulders is a great touch, and when/if the day brings in some crisp air, you’ve got a lightweight jacket handy. Snapped by Harper’s Bazaar, this transitional spring look brings back the amazingness of a stable denim jacket. Worn over embroidered bell sleeves, paired with a black-on-black footwear/pants combo, this look combines pops of color while also keeping you cozy for sunset when the cool breezes blow in. It seems like just yesterday we were mixing floral patterns with stripes and wearing one hoop vs. one stud in our ears… But these days, fashion is all about ease. Embrace “The Outfit” between seasons with a pullover and shorts combo. When it’s not quite sandal season, throw on a pair of chucks or booties to complete the ensemble. The athletic trend, combined with decidingly feminine flourishes, comes packed with a cool-school attitude (in a good way, of course). Such as with the look above, the dainty white dress with Nikes and a black leather is certainly going to carry you through a clear spring-ish day with contentment and stylishness. Note: a moto-staple jacket will always serve you will during transitional phases.